The iOS version uses Core MIDI, and should be compatible with class-compliant USB MIDI devices (via a Camera Connection Kit) as well as devices connected via wi-fi (RTP) or Mac and iOS devices connected via Bluetooth Low Energy. The Android version, on Android 6 or later, can send and receive MIDI over USB (via a USB OTG cable) or Bluetooth. Older Android versions use a third-party framework that can send and receive MIDI over or USB or wi-fi (RTP). You can optionally use the old framework on newer Android versions with the Help > Utilities > Use Old MIDI Framework setting. Note: The total amount of MIDI data you send per song (bank and program changes, song select messages and raw MIDI) is limited to 64kb. This step is optional but recommended. It allows you to see your MIDI device names in the app and quickly change the port or channel a device uses without having to edit all your MIDI data. Some devices count MIDI values from 0-127 and others from 1-128. If you set the numbering style to match your device, you can then enter values using the same style to avoid confusion. Once you've registered some of your MIDI devices, BandHelper will only allow you to enter program changes for those devices, so you must register all the devices you wish to send program changes to. You can only enter one device per channel per port. You can edit an existing device to change its name, port or channel at any time. If you delete a device, all program changes and control changes for that device will be deleted. 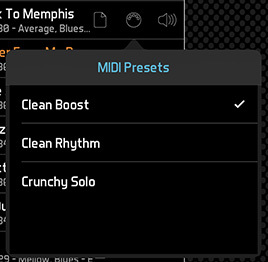 Navigate to MIDI Presets in the main menu and tap the + button at the top of the list to add a new MIDI preset. For program changes, you'll see a set of three fields for each of the 16 MIDI channels, or for each registered device. The first field is the bank change (MSB), the second field is the bank change (LSB) and the third field is the program change. 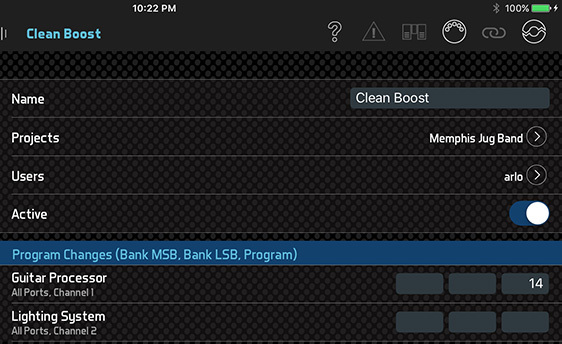 You can enter any combination of MSB, LSB and program values, leaving fields empty if you don't need them. Values are counted from 0-127 or 1-128 depending on the Numbering setting for the MIDI device. For control changes, you'll see a set of two fields for each registered device if you define your MIDI devices as shown in the previous section. The first field is the controller number and the second field is the value. Values are counted from 0-127 or 1-128 depending on the Numbering setting for the MIDI device. For other MIDI data, you'll see one large text field labeled Raw MIDI. You can enter any MIDI data in hex code; for example, to set channel 4's volume to 90, you would enter B3 07 5A. You can find a complete list of MIDI message codes at midi.org. If you want to annotate your raw MIDI code for future reference, you can include C-style comments: either from // to the end of the line, or from /* to */. If you want to only send the raw MIDI to one device, you can select the MIDI Device above the Raw MIDI field. If you want to send some raw MIDI to one device and some to another, you will need to create separate MIDI presets. You can attach other presets to a preset, so that when you trigger the parent preset, all the child presets are triggered automatically. Enter a name for this MIDI preset. The preset will be saved when you leave this page. You can determine the order in which the parts of a MIDI preset are sent, from Settings > Audio & MIDI > MIDI Options > MIDI Preset Order. If needed, you can also add a pause between the parts with the With Delay Between option. Navigate to Songs in the main menu and tap a song to edit it. In the song edit window, scroll down to the MIDI Presets list. This will show any MIDI presets already attached to the song. To attach MIDI Presets, tap the Add MIDI Presets button. This will open a list of all the MIDI presets defined in this database. You can tap the presets you want to attach to your song; a checkbox will appear next to each preset you've selected. When you're done selecting presets, tap Save. Your selected presets will appear in the previous window. If needed, you can rearrange this list by dragging the "grip" area to the right of each preset. The first preset in the list will be the default preset throughout the app. Your changes will be saved when you navigate away from this song..
Now a MIDI icon should appear next to the song in any song list . You can tap this button to send the MIDI program changes and raw MIDI data for the default preset, which is the first one in the list for that song (unless you change Settings > General Settings > Defaults > MIDI Preset). If you have attached more than one preset, you can tap and hold the button until a submenu appears, then tap the desired preset name to send its data. If you want to access your default preset more quickly in the set list view, navigate to Layouts > [layout name] > Edit Details > Layout Actions and set Send MIDI to Song Selection. Then BandHelper will send your preset data whenever you select a song in the show view, whether by tapping the song title, using a remote control action, or swiping through your songs. If you want to access multiple presets more quickly in the set list view, you can edit your layout and add Multiple MIDI Buttons to the set list or the song info area. 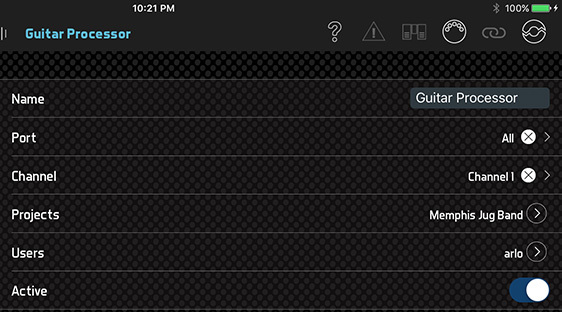 Then BandHelper will show a button for each of the attached presets when you select a song. If you want to trigger MIDI presets while performing a song in a completely automated way, you can record an automation track for the song and trigger each preset from the screen interface at the desired times. Then when you play back the automation track, BandHelper will trigger the presets for you at the designated times. Normally you would attach multiple presets to a song if you want to send different MIDI messages at different times during the song. But you can also configure BandHelper to send all the attached presets when you select a song, if you set Layouts > [layout name] > Edit Details > Layout Actions > Send MIDI to Song Selection and turn on Settings > Audio & MIDI > MIDI Options > Send MIDI Presets Together. You might want to send two similar MIDI messages to turn a setting on and off on a device. In that case, you can create two MIDI presets, then edit the first one, click Pair With Preset, and select the second one to link them together. Then add just the first preset to your song. When you click its button, BandHelper will send the first preset. When you click the button a second time, BandHelper will send the second preset. If you have some MIDI presets that you want to access from any song, such as a preset that turns off vocal effects for song introductions, you can attach it to a layout on the Repertoire > Layouts > [layout name] > Edit Details page. Then the preset will be available when viewing any song with that layout. Layout presets will not be included with the Send MIDI Presets Together function. Navigate to the Songs list and tap a song. Scroll down to the MIDI song number field and enter a value from 0-127. Now a MIDI icon should appear next to the song in any song list . You can tap this button to send the song number. The song number will be sent automatically whenever you select the song in the show view. Note: MIDI Beat Clock is not available on Android devices with less than Android 6. Navigate to Settings > Tempo & Pitch and turn on the "Send MIDI beat clock" option. Edit a song and enter a tempo value. You can enter a number, or use the Tap button to set a value. Save the song to reload the Songs list, or navigate to a set list or smart list, and tap the Tempo button for a song. The icon will begin flashing, and the beat clock messages will be sent. To send the MIDI beat clock only to a specific port, you can change Settings > Tempo & Pitch > Tempo Options > Send Beat Clock to Port. Otherwise, it will be sent to all available ports. On iOS, you must first obtain a SoundFont (.sf2) file. Copy the SoundFont file into the app, then select it from Settings > Audio & MIDI > MIDI SoundFont File. You can copy multiple SoundFont files into the app, then switch between them by changing this setting. The Android app uses Android's default MIDI synthesizer, so you don't need to do this step, but you can't change from the default sounds. Create or obtain a Standard MIDI File (.mid) with musical content (MIDI note messages). Add the MIDI file to BandHelper. From the Songs list, create a new song, or select an existing song. Click Add Recordings and select the MIDI file. This links the MIDI file to the song. Click the song's Recording icon from anywhere in BandHelper. You can pause or skip around in the MIDI file the same way you can with other recording formats. Note: Sending data from a Standard MIDI File is only available on iOS. Create a Standard MIDI File (.mid) that sends MIDI messages. 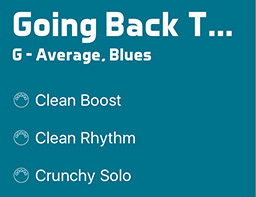 From the MIDI Presets list, create a new MIDI preset, or select an existing preset. Click Standard MIDI File and select the MIDI file. This links the MIDI file to the preset. Send the MIDI preset from anywhere in BandHelper. Any data in the preset, plus the data in the file, will be sent. You cannot pause or stop the MIDI data once it starts sending, but it will stop when you navigate away from the current page. Note: Syncing a MIDI file with a recording is only available on iOS and only with the new audio engine (e.g., Help > Utilities > Use Old Audio Engine off). Create a Standard MIDI File (.mid) that sends messages in time with an audio recording. Add the recording and the MIDI file to BandHelper. From the Recordings list, select the recording to view its edit page. Click Standard MIDI File and select the MIDI file. This links the MIDI file to the recording. Play the recording from anywhere in BandHelper. As it plays, the data in the MIDI file will be sent in time with the audio. If you pause, scrub or change the speed of the recording, the MIDI data will change to keep in sync. Send bank and program changes or other MIDI messages from another MIDI device. Any incoming MIDI messages will automatically populate these fields while MIDI Learn is active. Any messages other than bank and program changes will be added to the raw MIDI field. This does not include MIDI Realtime and Undefined messages, which BandHelper will ignore. When you have finished populating these fields, tap the MIDI Learn button again to deactivate it, then save your preset.